The good thing about the Apple Watch being such a fantastic smartwatch is the level of convenience it offers. Of course, the bad thing is that it seems like everyone on the planet has one. If you want to separate yourself from the pack a bit, the best way to do it is by getting yourself a few unique watch bands to swap out from time to time — and the good news is you don’t need to spend a lot of cash to do it. In this post, we’ve collected five great Apple Watch bands that are all available on Amazon for less than $20 each. Definitely check them out. Major Upgrade: Connector is UPGRADED that it will NEVER fall off as the screw and screw’s depth is renewed and is added glue at the same time that it will be screwed more tightly and deeply, the band will never broke. 【SUPER QUALITY】Top stainless steel mesh loop, really dressed up your Apple watch and ensure the security of your watch. Fit for all 42 mm versions of the Apple watch. 【STRONG MAGNETIC】Strong magnetic clasp, convenient for you to adjust the iwatch band size; Ensure your watch in steady and secure, no problem for most sports. 【BEST DESIGN】Mesh loop with durable adapters, very comfortable to wear and easy to install; Replace 42mm Apple watch band easily and directly. 【SPECIAL GIFT】iWatch band is eco-friendly, low-key, elegant and practical. Best gift for yourself, your family and friends. 【LIFETIME WARRANTY】Support 24 hours customer service. Please contact us without hesitation if your watch band has any problems. Please search “yearscase ” to get other accessories offered by NH Tech. Any question please feel free to contact us. 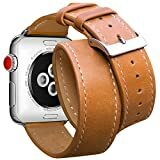 Compatible Models:The apple watch bands are suitable for Apple Watch Series1/ 2/ 3.38mm size fits 5.11″-8.66″ (130–200mm) wrists.42mm size fits 5.11″-8.66″ (130–200mm) wrists. 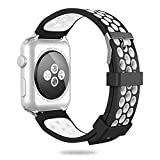 Durable Material:Accessory bands for apple watch is made of pure silicone and flexible elastomer,with surgical-grade stainless steel buckle. Easy to wear:Band comes with Watch Lugs on both ends, which locks onto Apple Watch Band Interface precisely and securely. Easy and direct to install and remove. Order with confidence for replacement or full refund without return the item.Any problems,please kindly message us. 18 Month Warranty: Our warranty time is longer than others as our quality is guaranteed, unconditionally refund or resend with any quality problems, life time friendly customer service, ONLY offered by Marge Plus store. Design: Extra-long Double Tour wraps elegantly twice around the wrist, Made from high-quality genuine leather, Appreciate the superior craftsmanship and refined metal clasp that fits in the Watch slots perfectly, This gives a tight fit to hold your precious on your wrist. 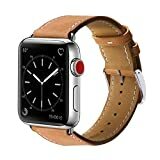 What You Get: Marge Plus Double Tour Leather iwatch band 42mm × 1.